Plot Outline: Tom Popper grew up having very little interaction with his father who was off exploring the world. When he grows up he spends most of time on his work and ignores his children. 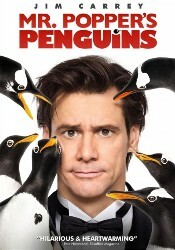 One day his father sends him an unusual gift: six penguins. Popper can't help but wonder why his father would send him penguins. He tries to get rid of them. But when his children and ex-wife show up to celebrate his son's birthday, the kids are taken with the penguins. And Popper finally gets to connect with his kids and his work suffers.